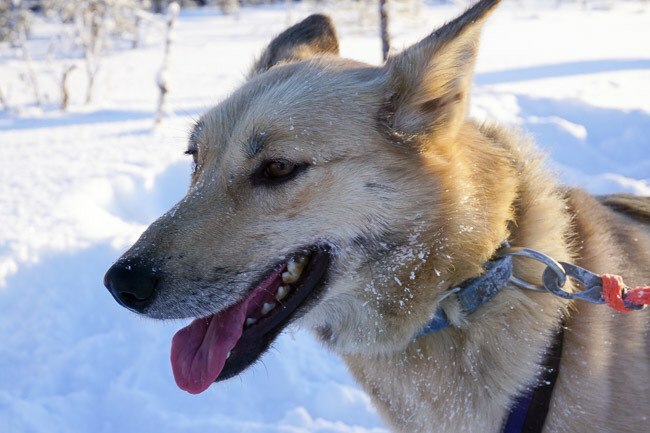 From the moment I planned to my trip, I knew I wanted to go dog sledding in Finnish Lapland. The thrill of gliding across a frozen landscape in a dog sled had a wild, rugged, and irresistible feel to it. This urge was only made stronger after visiting Skelleftea in Swedish Lapland this past summer. I did my due diligence research and knew Bearhill Husky was the best option during my stay in Rovaniemi, Finland. 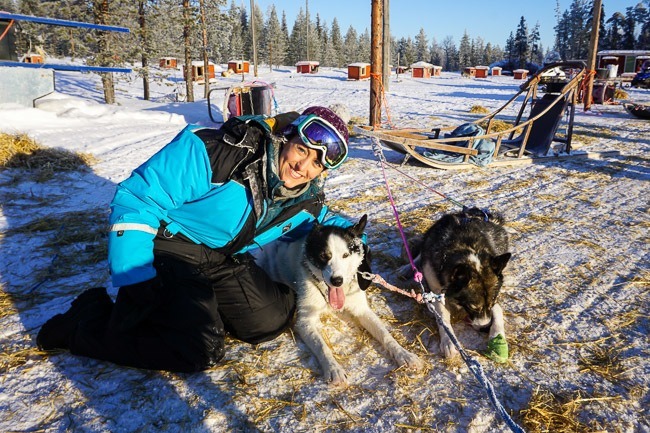 I’m an animal-lover and, with 3 dogs of my own, would only take part in a dog sledding experience where the dogs were truly loved and well-taken care of. Bearhill Husky is family-run and owners Valentijn and Veronika have dedicated their lives to working with and caring for their huskies. “It’s our passion to work with dogs, breed them, train them and let them be the best dogs they can be.” Bearhill’s own website has a philosophy and ethics page. Reviews on social media and TripAdvisor (Bearhill’s #1) are glowing with details about the dogs and the experience. 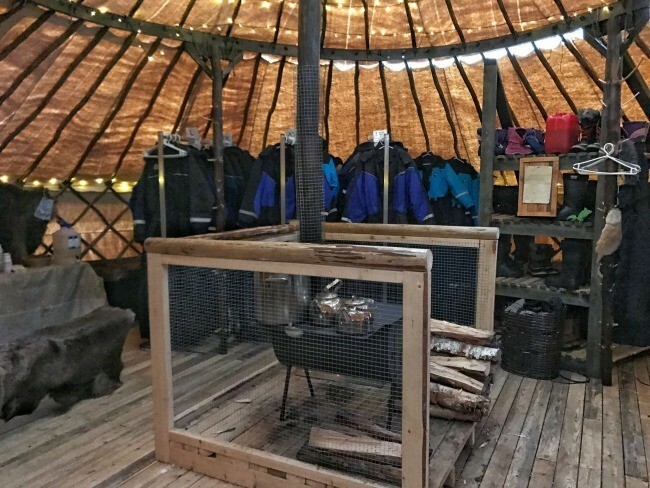 Other travel bloggers have raved about and recommend Bearhill Husky, as well. 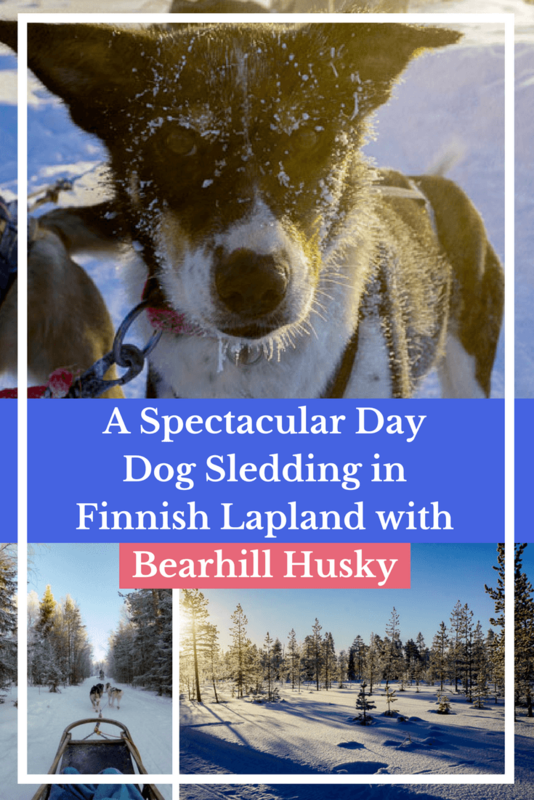 As it turns out, we, human visitors, are also well looked after and the dog-sledding is just one part of the completely incredible Bearhill experience. Leaving the city center of Rovaniemi behind, the evergreen trees thicken and the roads go from a partly cleared to a solid white covering. You can hear the excited husky cries as soon as you pull into Bearhill Husky Farm. The dogs know what’s coming and they jump and bark in anticipation. Our guide, Miika, greeted our small group with a cheerful hello and a warm smile. Invited into a nearby yurt, Miika helped prepare us for the -25C/-13F temperatures (Yes, that’s without accounting for the wind on the sled!). Bearhill Husky provides arctic overalls, extra wool socks, proper boots, face covering, and gloves. With the right Arctic gear and my own ski hat and mask, I could’ve stayed outside all day! Back outside and all geared up, we got instructions on how to manage the dog sled. While one person sits in the sled itself, the driver stands on the back wooden legs of the sled and holds on to a crossbar. The Call of the Wild Tour runs through the forest and out across a frozen lake for a good mix of speed and technical driving. The group size is small, with about 4-6 dog sled teams in total and several experienced guides. A stop halfway through gives the dogs a rest (read: roll in the snow!) and allows you to take photos and switch drivers. With all the preparation, though, nothing quite prepares you for the exhilarating moment when the dogs first take off. 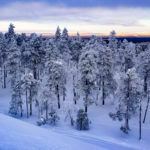 In an instant, you’re surrounded by a pristine snowy, white forest and nothing but the sound of the sled gliding over the snow and the dogs’ heavy breathing. I’d been on a snowmobile the day before but this was different. I wasn’t interrupting the hush of nature during winter. I wasn’t leaving unnatural scars in the blanket of white covering the forest. The dogs and I were an extension of that winter wonderland. The air was frigid but fresh. The sky was blue and the sun lingered over the horizon with just enough blinding light to make it seem as if the dogs were running to a place where everyone really does live happily ever after. My practical side expected to be focused on the unique experience and how dog sledding has been fundamental to the culture of Lapland for centuries. Instead, it was all emotion. I felt totally free, on one hand, and bonded to the dogs in another. It’s the connection that forms from a deep respect and appreciation for the work these amazing animals do. The experience requires that you live in the moment. The dogs certainly are, and together, you’re working to create a mutually fulfilling experience. 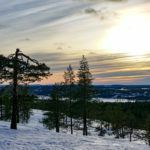 In all honesty, the experience was nothing short of spectacular and an absolute highlight of my time spent in Finnish Lapland. But, moments are fleeting. When you land on a good one, it’s hard not to squander it wishing it could last longer. As we took the last turn back to the farm, I focused on soaking up every last detail. With the sled secured back at the farm, I had time to socialize with my dogs and say “hyvä, hyvä ” good, good. The praise keeps them motivated and feeling good about what a great job they did. The guides and caretakers came around and checked the dogs while I learned the dogs’ names, took photos, and asked questions. You notice right away how comfortable the dogs are with their caretakers and how well-socialized they are with visitors. Dogs don’t lie. You can see the satisfaction and enjoyment they’re getting from running. When you pet them, you can feel how healthy and solid their coats’ and bodies’ are. Dedication to helping the dogs be the best they can be. Not only are trails switched and the routes varied to keep the dogs mentally fresh. The caretakers at Bearhill Husky recognize when dogs need a challenge or something new to think about. For example, they might take a lead dog and put him in the back to change his perspective. At the same time, the new dog up front is a challenge for the more seasoned leader who has to think about how to keep his new partner moving forward. In addition, a work-rest balance is key. The dogs work on a rotation, always getting at least 2 days off a week. In summer, they’re on holiday and run free with their caretakers. Eventually, we had to say our final goodbyes to the dogs. On our way back to the yurt, we stopped to pet a couple super playful puppies. Miika explained a bit about how they’re raised and trained. When you visit Bearhill Husky, it’s so important to recognize everything that goes into the dog sledding experience. It’s not just about the ride on the sled, but rather joining with the dogs to participate in something truly special. Bearhill Husky Farm is about 20km north of Rovaniemi. The tour price includes transportation to and from the farm. Pick-up spots cover Rovaniemi’s popular hotels and city center. Even from our Airbnb, the pick-up was just a block away. The van arrived on-time, which is greatly appreciated on those frosty Arctic days. Bearhill Husky offers 3 different tours. The “Call of the Wild Tour” departs mornings and afternoons. It lasts about 4.5 hours including the time it takes to transfer back and forth between Rovaniemi and the farm. You’ll drive/ride about 16-22kms through the snow-blanketed forests and over frozen-solid lakes. The tour costs 159€ per person for a 2-person sled and 239€ per person if you’d like your own dog sled. The “Taiga Husky Tour” runs every Wednesday January-April. It’s a full day of dog sledding, with a stop for a campfire lunch out in the wilderness. You’ll drive/ride for 30-40kms and learn more about the huskies and the art of a skilled musher. 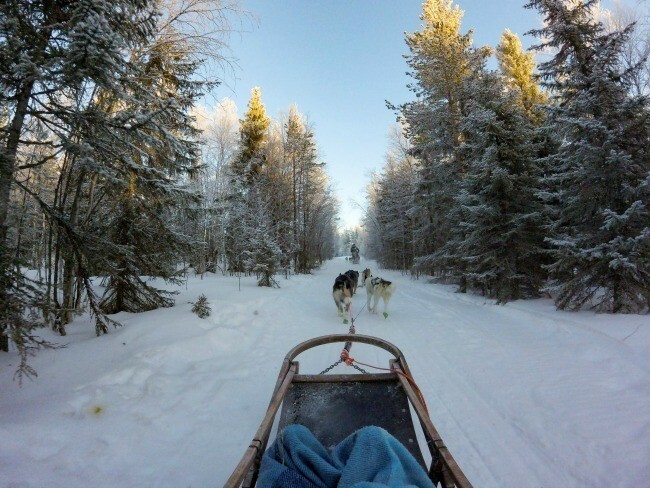 This tour is 259€ per person for a 2-person sled and 309€ per person to drive your own dog sled. The “Into the Wild Overnight Tour” is a small group tour that leaves on Saturday mornings and returns Sunday afternoons. 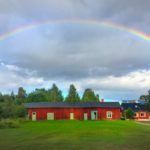 You venture out into gorgeous Lapland with experienced guides and stay overnight in a rustic wilderness cabin. You’ll learn about and help with the care of your dogs, cook lunch around a campfire, and relax in the cabins for dinner and breakfast. This tour costs 620€ per person for a 2- person dog sled and 850€ to drive your own. 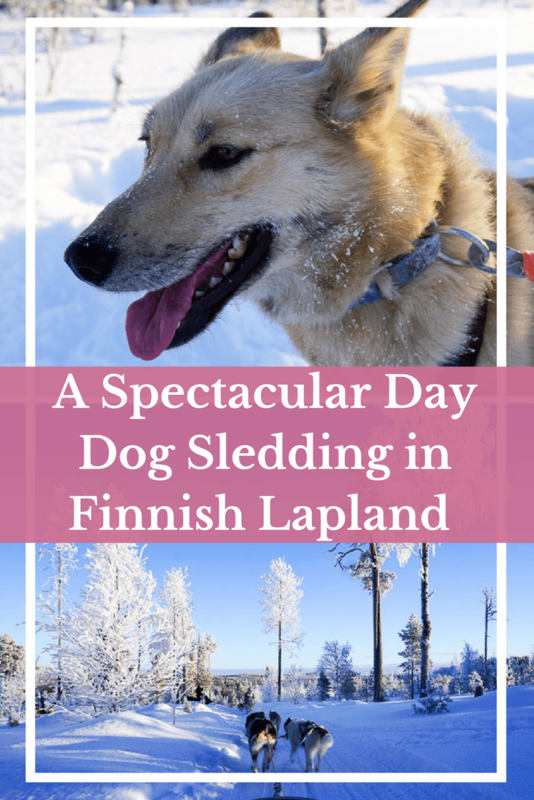 Would you like to dog sled in Finnish Lapland? Have you been dog sledding in another frosty place? Disclosure: I was a guest of Bearhill Husky. As always, all opinions are my own. This was a great article! I couldn’t stop reading this! Your words expressed the experience in a way that made me feel like I was there. I only wish I could have been! Thank you for sharing! Thanks so much! 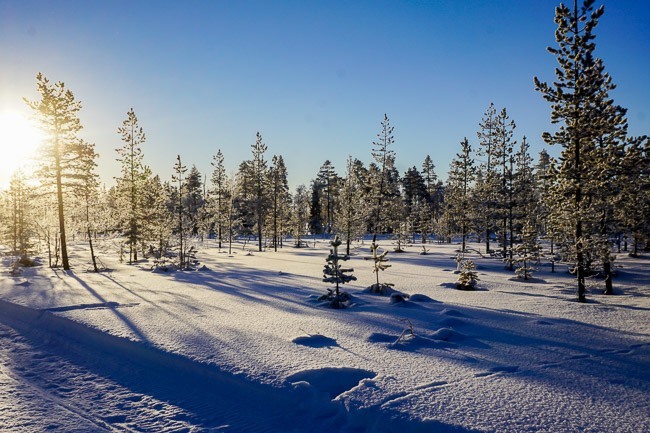 The Call of the Wild Tour is not to be missed when you’re in Finnish Lapland. Wow, what a stunning day and gorgeous blue skies, love the post and it must have been a really exciting experience to be with all those dogs and do some sledding. You said it, Noel. We were so lucky to get a bright blue morning. Either way, though, the dogs and the experience is spectacular. I have v=never experienced something like this! 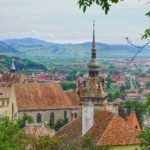 Totally broadened my travel horizons reading this post! I am such a sun chaser this got me thinking I should book a snow holiday soon! Thanks for all your great tips! Lovely blog you have too by the way! I loved Jack London as a kid. I had Into The Wild curtains and bed spreads made. I dreamed of owning a malamute and moving to Alaska. In fact, This trip speaks to me in ancient tongues. I don’t care if it’s cold. There is no such thing as cold weather, only bad gear. I do care that these glorious dogs are taken care of. I bet the wouldn’t trade this life for any other. In my dreams, imagine going on the Into The Wild overnight tour. Hopefully we don’t end up in a bus eating berries). 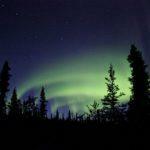 If we could see the Northern lights to that would be absolutely amazing. I’ve just been talking with my parents about a trip to Finland and top of the list is husky sledding! 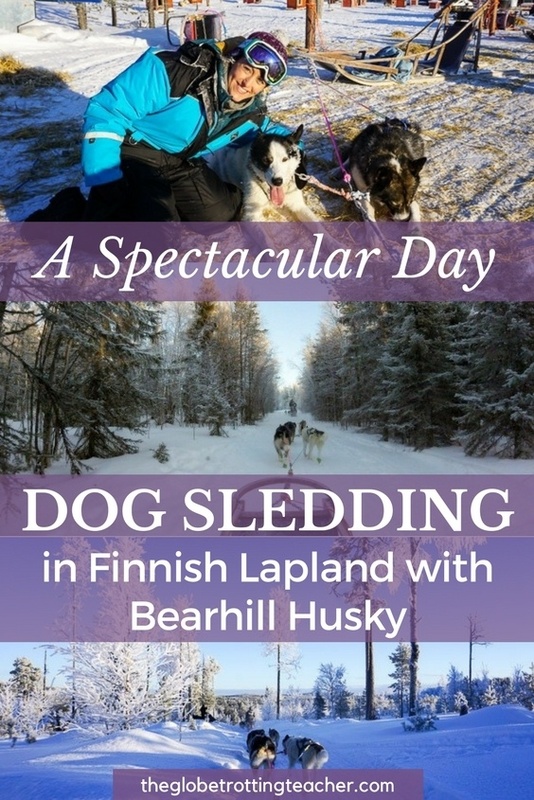 I love how at Bearhill they are really looking out for the dogs, huskies do need to be mentally challenged and amused so I like this ethical approach – that is something that would worry me otherwise. Agreed, Samantha. It’s so important to do your research and make sure animal experiences are on the up and up. Hope you get to Finland soon and keep an eye out. I have more posts coming about my experiences and itinerary. OMG, really want to do this. I was aware of dog sledding but hadn’t seen (the video) or read about it in so much detail. Loved how you break down all the aspects of it and that the folks at Bearhill are professionals and take care of the huskys. The scenes in the video and the photographs are simply breathtaking. The landscape is wow! Beautiful experience and thanks for sharing the same. So glad you enjoyed the post and the video. I was so impressed with Bearhill. The caretakers were so skilled and dedicated to making sure the huskies were happy and healthy. Hope you can make it to Finnish Lapland and Bearhill soon! This is a bucket list experience for sure. I especially love that the dogs happy and we’ll cared for. Oh my, this is something I really want to do! Every time I see someone do it in any part of the world I tell myself I want to do this one day! It looks like a great trip and that they take care of the dogs properly, which is SO important. Sledding looks like SO, SO, SO much fun! I wanna cuddle those adorable dogs! I know how you feel, Rachel! They are amazing dogs. Beautiful! It sounds like an amazing experience. I would love to do this one day. Plus, I love puppies, so BONUS! It’s a bucket list experience for sure, Shannalyn! 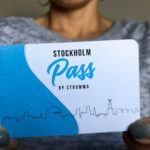 Add it to yours for when you visit Finnish Lapland. This is a bucket list item for me. I am a dog lover and I really liked how this company treats their dogs. Could you take photos during the slide or was it dangerous? this sounds phenomenal. 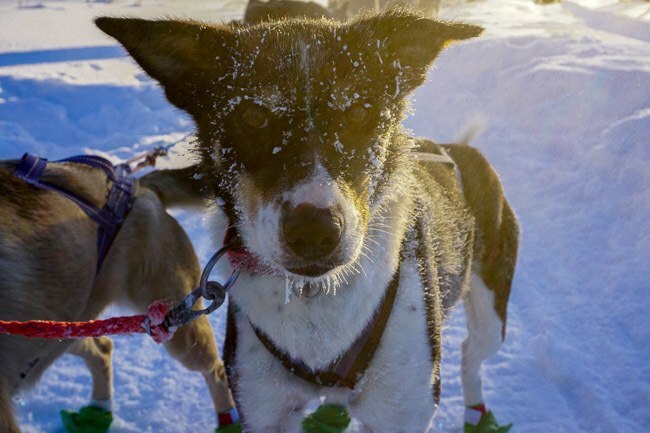 I have never had dog sledding on my bucket list but after reading your post, I may have to reconsider. So did you drive the sled too? I assume since you said half way they switch drivers. Not sure what would be more amazing, riding and taking it all in, the sounds and views…or driving with the thrill of controlling the dogs. Definitely add it to your list, Eric! I did have the chance to drive and then I switched to ride in the sled while my husband drove. On one hand it’s great to sit back and take it all in, but on the other hand, it’s great to feel the power of the dogs as a driver. I’ve always wanted to do this. I’m such a dog lover. 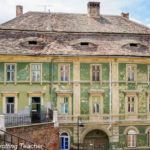 It’s great to see they are so well cared for. I’m happy to know that Bearhill Husky Farm truly takes care of its huskies (they do seem quite gleeful!). Looks like you had an amazing time in the Laplands – the description of your experience made me feel like I was sledding carefree right next to you! So glad to transport you to Finnish Lapland, Lydia! The dogs really were so happy and friendly. 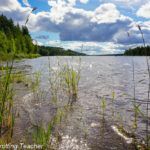 I have just come back from Finland and I can totally relate to your story. Though I did not do Dog Sledding in Rovaniemi , but I had great fun doing snowmobiling, snowshoeing and Reindeer safari in Saariselka. I can’t tell me how much I loved Lapland. Its something magical. 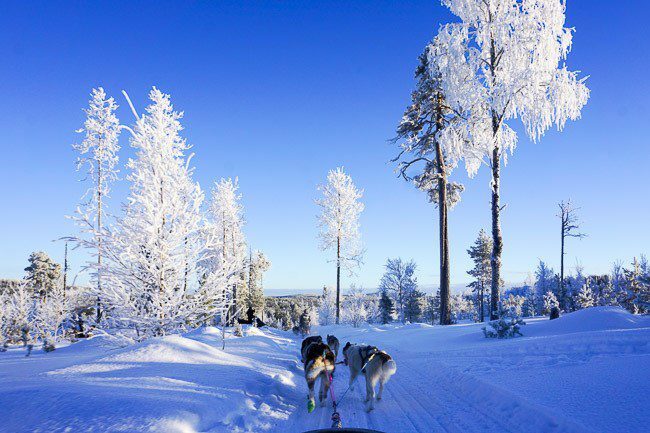 I’ve always wanted to go dog sledding in Finnish Lapland too! I was in Rovanemi in 2007 but didn’t have the chance to organize this. It sounds like a spectacular experience, thanks for taking us with you! I’m glad to hear that the dogs are well cared for and well treated too, and that they themselves love running – I’ve heard mumblings from animal welfare articles about dog sledding though admittedly haven’t researched it to find out what the concerns are. Bearhill Husky is on the list! Thanks, Jenn! Hope you get to do some dog sledding soon! -13F?! WOW! What a cool experience though. Ha, get it? 😉 But seriously, I’d love to visit Lapland. I’ve only heard amazing things.